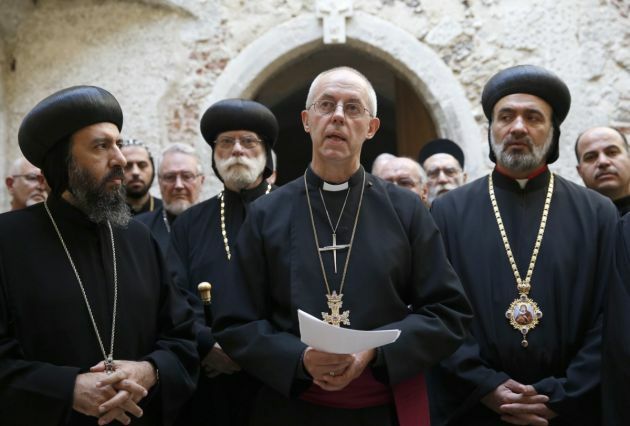 (Photo: REUTERS / Luke MacGregor)Bishop Angaelos (L) the General Bishop of the Coptic Orthodox Church in the UK, and Archbishop Athanasius Thoma Dawod of the Syriac Orthodox Church (R) listen to Archbishop of Canterbury Justin Welby (C) as he speaks to the media following a meeting at Lambeth Palace in London September 3, 2014. The Archbishop of Canterbury Justin Welby has attended the 'Creating the Common Good' conference held at the Trinity Institute in New York and given a speech in which he tackled the issue of 'Is Inequality Sinful?" The conference, held every year, has a focus this year on the topic of inequality. The archbishop who is spiritual head of the Church of England and viewed as the most seniior bishop in the 88-million strong Anglican Communion expressed admiration at the efforts of the Trinity Wall Street church and added that he follows the conference every year. In his speech, the archbishop addressed the question on inequality and sin from a theological perspective. He raised the question, 'Does inequality matter? ', and addressed the possibility that perhaps the wealthy are being persecuted merely because they are wealthy, and are thus need defending rather than being attacked. The archbishop referenced the Genesis story, explaining that the Creation story involving Adam and Eve reflects the equality in the creation of human beings and how it is essential in human nature to know and walk with God intimately. From his speech, he said, "There is an equality of worship, in adoration of the presence of God; there is an equality of revelling and feasting in fellowship with God in the Garden. Equality is a gift in creation, it is the foundation of equality before the law, equality of voice in the public square, equality in righteousness." The archbishop spoke about inequality in the modern context. He cited Warren Buffett and Bill Gates as people who manage their wealth for the sake of the common good, and points out that the Bible is not against the creation of personal wealth but it admonishes the "systematic and indefinite accumulation of grossly unequal societies" that leads to abusive behaviour. He referenced the 2008 financial crisis as one such example. The full transcript of the speech can be found at the Archbishop of Canterbury's personal website.